The site of the proposed new building for University College is that previously occupied by the building constructed by the Oxford University Boat club in the 1860’s on University College land. We worked to a briefing meeting held at the estates department and a planning report produced for the site. The new boathouse was to contain boat storage, spaces for the social needs of the Club as well as accommodation for University College graduates and a key-worker flat. It was decided that the new design would emulate the old College boathouse to a certain extent in terms of symmetry and presence on the river bank to recognise the long history of rowing on the site. The positioning of the building was partly dictated by the presence of water voles at the Thames end of the Eastwyke Ditch whose habitat is protected under the Wildlife and Countryside Act 1997. The whole site lies wholly within the functional flood plain of the River Thames, and any development on it is subject to prior approval by the Environmental Agency in terms of both floodwater storage and conveyance. From our experience at the new boathouse for the OUBC at Wallingford, we were aware of two solutions that are likely to be accepted by the Environment Agency in terms of floodwater conveyance across the site. 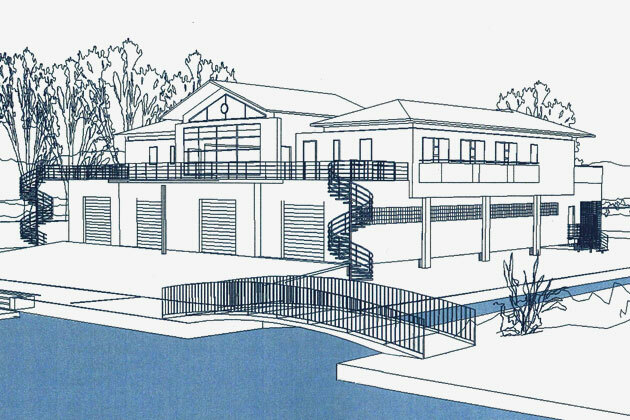 The first of these would be to keep the building at ground level, but set the boathouse bays parallel to the river and have openings at each end (opening during a flood alert) to allow floodwater to pass through the building unhindered. 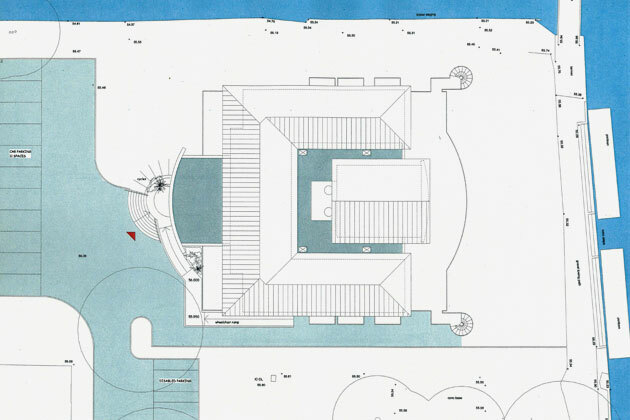 The alternative solution is to keep the boathouse bays perpendicular to the river, but raise the entire building out of floodwater by the use of short columns between the underside of the ground slab and the general ground level. 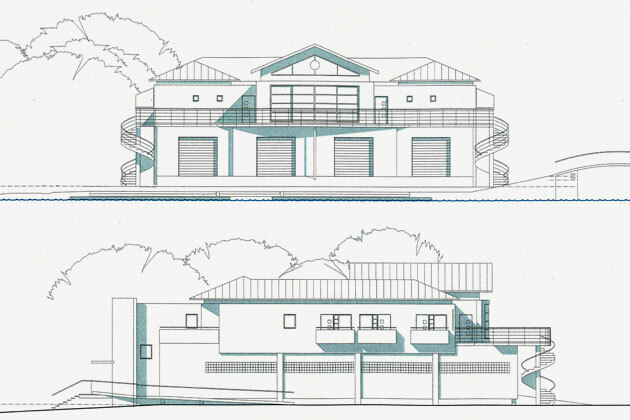 The current design is based on the boathouse solution with perpendicular boat bays and raised ground floor level. 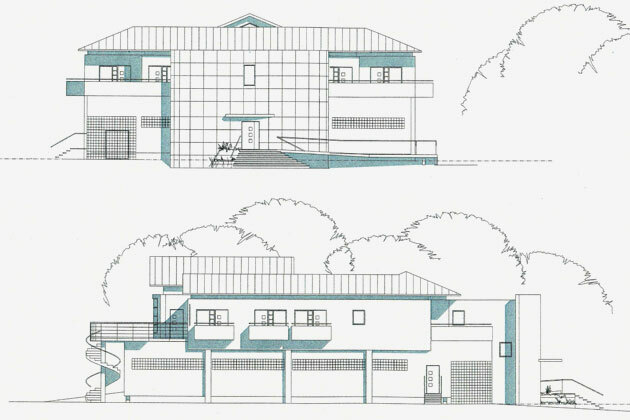 It was necessary for the design to take account of two directions of approach to the building. Oarsmen and women using the building are likely to arrive on foot or by bicycle along the towpath from Folly Bridge, or on occasion by punt from the other side of the river. 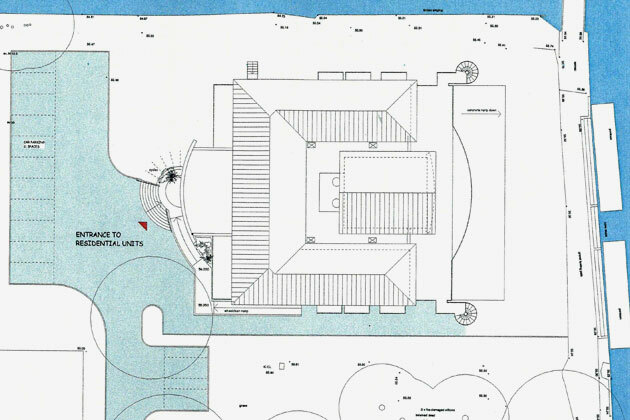 They will approach the building at its northern corner, and will need to access both the boathouse and the first floor club facilities from the river elevation. The residents of the first floor graduate accommodation and key-worker flat however are equally likely to arrive by road from Abingdon Road, and necessarily so if they arriving by car or motorbike. The ‘back’ face of the building away from the river must therefore be designed to have appropriate status as the main entrance for residents, and to look good to anyone walking down to the river from Abingdon Road. Members of the club approaching the building via one of the external spiral staircases arrive at an external terrace running across the whole front of the building, providing good views of the river. The clubroom, projects forward onto the terrace to the residents’ corridor and provides a means of escape in case of fire. The building is fully accessible to disabled people, including wheelchair users, and included in the graduate accommodation is a unit suitable for occupation by a wheelchair user. The building was designed as a single entity, essentially symmetrical about the axis lying at right angles to the river. The dominant element on the elevation facing the river is the clubroom at first floor level, which is a double-height void with high level clerestory glazing to front and back. The graduate accommodation and ancillary space is then ‘wrapped’ around this clubroom on three sides. 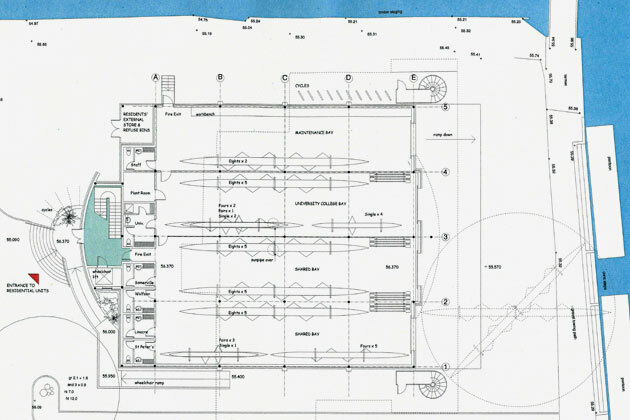 The four boat storage bays have been designed at the full 6m width required for boat storage and are 24 metres long. The maintenance bay, situated at the north west edge of the building (i.e. nearest to Eastwyke Ditch) is therefore wide enough to accommodate eights stored along one wall, a workbench along the other, and still have adequate space for maintaining a boat on trestles in the middle. On the first floor the at the top of the main staircase the corridor splits around the sides of a courtyard and centrally placed clubroom and from it open off the doors of the individual graduate rooms. Six ‘standard’ rooms are provided, with en-suite shower rooms and built in cupboards. 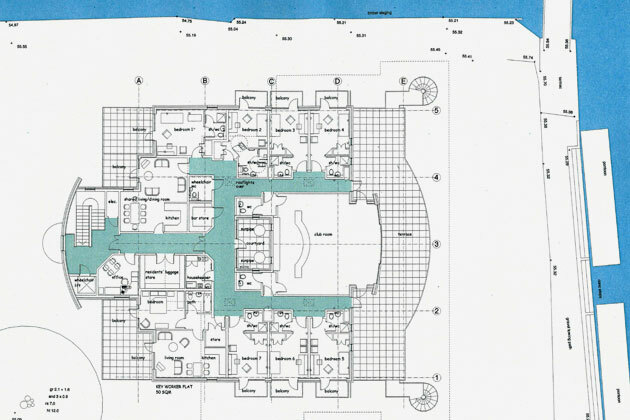 A seventh room suitable for occupation by a wheelchair user is provided, including enlarged shower room. Each graduate room is provided with its own private balcony, most of which have oblique views of the river, and all receive either morning or evening sun. A separate shared living/dining room, with kitchen facilities and its own balcony, is provided for the use of all residents in the graduate flats. The principle materials proposed for the external envelope of the building are brick walls, with sections of self-coloured rendered blockwork at first floor level, and possibly stone or reconstituted stone blocks for the large curved wall on the southwest elevation. The material proposed for the pitched roof is metal with a traditional standing seam detail, but equally could be natural slate. All doors and windows are intended to be polyester powder coated aluminium, incorporating thermal breaks and sealed double glazed units, to provide a long maintenance free life.